'Percenta Nano Concrete & Flooring Sealant' is a dirt and scuff resistant coating material based on nanotechnology. Nano particles result in a longer life for the treated surfaces. Our 'Concrete & Flooring Sealant' provides protection against loam and soil, as well as contaminants due to, for example, wet leaves, oil and food. Use 'Percenta Nano Concrete & Flooring Sealant' as an invisible and multi functional impregnator for all porous surfaces, such as cement, concrete or house façades. After one treatment, an invisible, dirt-resistant and UV stable coating develops. All porous surfaces can be protected with nanotechnology. 'Percenta Nano Concrete & Flooring Sealant' is the ideal sealant, for example in agricultural businesses, to protect concrete stables and other surfaces which are at risk from bacteria. 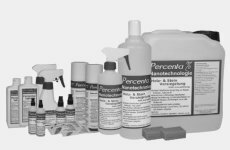 Bacteria and other germs can no longer get into concrete or cement floors after the treatment with our sealant. Loam, soil, wet leaves and animals' faeces can no longer adhere to the floor and can simply be washed off with water. Stables can be cleaned more easily and will be protected for longer against dangerous bacteria, which can cause diseases. Water is enough to clean the stables with. No need to use aggressive and expensive cleaning agents. 'Percenta Nano Concrete & Flooring Sealant' can also be used in car garages, car washes, festival halls etc, where floors frequently get dirty due to, for example dirt, oil and other things. Our sealant is the ideal long term protection against contaminants, which after the treatment can no longer adhere to the floor. 'Percenta Nano Concrete & Flooring Sealant' is free from silicone, wax and oil. The breathability will not be reduced after repeated treatments. 'Percenta Nano Wood & Stone' will provide the maximum effect after just one application and can protect the surfaces for up to 10+ years, depending on the use of the surfaces. The ideal sealant for all driveways at risk of damage through contact from motor vehicles and other scuffing. After using our sealant, rubber scuffs and adhering moss will be reduced, even on frequently used roads and pathways. All contaminants can simply be washed off with water. Farms frequently have to be cleaned thoroughly after the breeding of the animals. With our concrete & floor sealant, cleaning can be simplified and shortened. Faeces stay on the surface and can be simply washed off with water. Even bacteria can no longer get into the floor. Every garage owner has to cope with oil spills and rubber scuffs. When soaked into the ground, such contaminants can hardly be removed, if at all. Our 'Nano Concrete & Flooring Sealant' prevents these problems. Dirt, oil and grease can no longer get into the floor. Visually the workshop always looks perfect. Often mould can appear on the ceiling of car washes. This can be prevented with a nano sealant. Walls and floors can no longer soak up water and dirt. In a lot of factories you find grease and dirt all over the walls, which cannot be avoided. But after just one application of our sealant, such contaminants can simply be washed off. In the restaurant and food trade, wine, fat and oil stains on the floor are a daily problem. These are difficult to remove. These problems can be prevented with our nano sealant. The contaminants can no longer get into the floor or the pores of the ground. Simply wash off with water and it will remain looking like new. Kitchen worktops are usually already sealed from new, which prevents water soaking in. A lot of conventional sealants are only durable for up to 5 years. Our 'Nano Concrete & Flooring Sealant' protects for up to 10 years or more. Gravestones have to be looked after as moss, pollens, dust and dirt discolour and adhere to the stones year on year. This can be prevented with our concrete and flooring sealant. Contaminants can only stay on the surface and will not be soaked in. Breathability remains. Our 'Nano Concrete & Flooring Sealant' contains little nano ceramic particles. These surround all open pores and prevent dirt from getting in. The lotus effect stops after a short time, but the sealing stays for up to 10 years and more (see advantages). There is no mechanical abrasion/wear. Ideal for stones, which soak up water and can be worn down through use and exposure (Natural stones, untreated asbestos cement, sandstones, aerated concrete, untreated clinker bricks and masonry, other untreated paving stones).